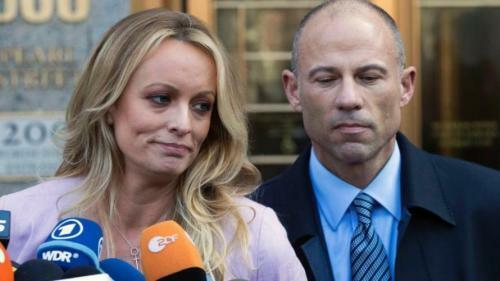 Two weeks after his arrest for allegedly abusing his girlfriend, Stormy Daniels says that Michael Avenatti sued Donald Trump against her wishes, according to a statement she gave to the Daily Beast on Wednesday. Avenatti also launched a now-deleted legal defense fundraising site without her consent. Daniels is now unsure if she will keep Avenatti on as her lawyer. "For months I’ve asked Michael Avenatti to give me accounting information about the fund my supporters so generously donated to for my safety and legal defense. He has repeatedly ignored those requests. Days ago I demanded again, repeatedly, that he tell me how the money was being spent and how much was left. Instead of answering me, without my permission or even my knowledge Michael launched another crowdfunding campaign to raise money on my behalf. I learned about it on Twitter. Avenatti hit back, telling the Beast that he has "always been Stormy's biggest champion," and that he's "sacrificed an enormous amount of money, time and energy toward assisting her." He also became a household name, so let's not pretend Avenatti did this out of the milk of human kindness. "I am and have always been Stormy’s biggest champion. I have personally sacrificed an enormous amount of money, time and energy toward assisting her because I believe in her. I have always been an open book with Stormy as to all aspects of her cases and she knows that. The retention agreement Stormy signed back in February provided that she would pay me $100.00 and that any and all other monies raised via a legal fund would go toward my legal fees and costs. Instead, the vast majority of the money raised has gone toward her security expenses and similar other expenses. The most recent campaign was simply a refresh of the prior campaign, designed to help defray some of Stormy’s expenses." According to NYU Law Professor Stephen Gillers, Avenatti could be in deep trouble if he sued Trump without consent. "If he filed the case with her name when it was clear that she told him not to, then he could be sued for that," said Gillers, adding: "He could be sued for malpractice. If true, she has a malpractice case against him. I emphasize if true. And if true, he would be subject to discipline but not as serious as disbarment." Avenatti claims that he hasn't "received a dime in attorneys' fees" from the crowdfunding efforts - one of which raised over $580,000 for Daniels' legal defense. He also claims that his firm has spent "well over a thousand hours of attorney time on the case at a value of over $1,500,000 (and no, we do not count interviews or media as attorney time)." As the Beast notes, Avenatti's legal work for Daniels hasn't been the greatest. Daniels made national news when she and Avenatti stepped into the national spotlight with a claim that President Trump's former attorney, Michael Cohen, paid her $130,000 to keep quiet about a decade-old affair - a claim Trump denies. Cohen has admitted making the illegal payments at Trump's direction and has pleaded guilty to eight criminal counts. Avenatti, meanwhile, was a rising star in the #MeToo movement until his arrest two weeks ago for allegedly roughing up his girlfriend. Lastly - according to court records, Avenatti and his companies owe millions in unpaid taxes to the IRS and from other judgements. It seems as though the tough talking attorney's 15 minutes may finally be up.